Step into Riyad el Cadi and your vision immediately seems to reset itself to sepia: this old-world riad is rife with neutral, earthy tones against stark white walls, and the sun lovingly casts a copper hue across the cascading courtyards. Navigate the complex warren of narrow hallways, bright, open spaces, and antique-laden salons and you’ll eventually find your way to a black-and-white tiled courtyard secreted away behind the kitchen. There, a colorful mis-en-place is laid out on a table shaded by a canopy of leaves. This sublime setting is where Riyad El Cadi hosts its authentic Moroccan cooking classes, set to a lilting sound track of birds chirping harmoniously in the background. 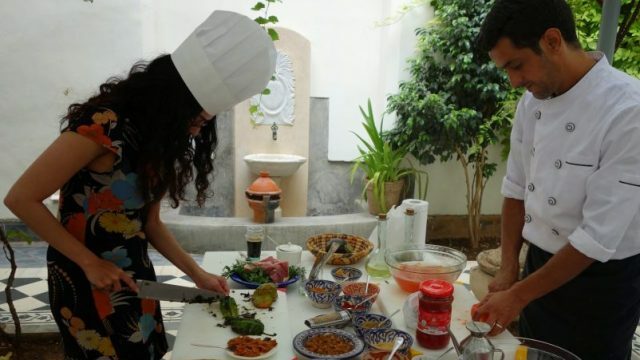 Surely there is no better place to learn to cook in Marrakech. 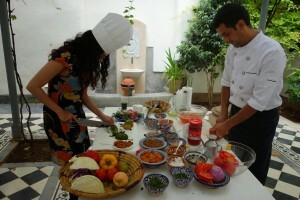 Moroccan cuisine is exemplified by its complex layering of flavors, and at Riyad El Cadi, house chef Hassan guides guests through his own expert techniques, using recipes and ingredients passed down for generations. You can sign up for a private class with your group at your convenience; if you don’t speak French or Arabic, the riad will also provide a handy translator — ours, Habib, was a worldly chap with restaurant experience in Europe, so he could really contextualize what we were seeing and help us understand the bigger picture. “Our use of spices is worse than in India!” exclaimed Habib, gesturing toward the array of bowls covering every surface of the table. Of course, while spices may be sprinkled in abundance to the dishes, their composition is distinctly different: flavorful and hearty, yes, but not very fiery; indeed, most of the dishes we sampled across Morocco were lacking in sweat-inducing heat, yet still remarkably savory and toothsome. 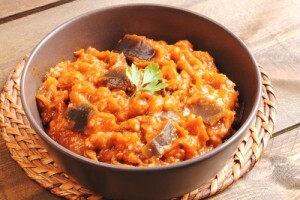 The interplay of sweet and sour is very common, with cinnamon, raisins, and saffron constantly dueling both on the plate, as well as on the taste buds. Hassan first demonstrated how to make two main courses: poulet au citron, a chicken doused in lemon preserves, and tagine makfoul, a hearty beef tagine. Both are classic dishes eaten especially in the Muslim holy month of Ramadan, Habib explained, served after the fast is broken at sunset. Tagines are ubiquitous around Marrakech — the word refers both to the meal itself as well as the vessel in which it’s cooked — and it was a delight to finally see what goes in to the making of one. Apart from couscous, tagines may be Morocco’s best-known culinary export, rich, nourishing stews made typically with beef, lamb, or chicken, though modern chefs will experiment with everything from rabbit to duck. The dish’s origins are most commonly traced to Morocco’s Berber community, though it’s widely eaten at every road-side stand and gourmet eatery across the country. Prep time is easy, but cooking is a slow, drawn-out process. For the chicken Hassan unloaded all the spices into a bowl — salt, pepper, ginger, lemon, and more — and placed the chicken within it, rubbing the marinade in with his hands, then set it on a stove to cook; for the beef tagine, he chose the leg, called malj (“it’s the creamiest meat,” declared Habib) and daubed it with pepper, cinnamon, salt, ginger, saffron, garlic, turmeric, and olive oil. Then he placed sliced onions in the peaked terra-cotta tagine pot, covered it with lamb, poured in some water, and set it to slow-cook with its own vapors. But we weren’t about to wait and watch. Hassan finally let us get more hands-on while making the mezze appetizers: zaalouk, a Moroccan antipasto salad with eggplant and tomato; another dish of fried eggplant with olive oil, garlic, and grilled peppers; tomato salad; and an unusual, sweet cabbage salad, doused liberally with cinnamon and honey and studded with raisins, apples, and apricots as well as balsamic vinegar, mustard sauce, and almonds. Sweet and sour, exemplified. We then turned our attention back to the tagine, adding ginger, pepper, tomato, more onions, and cinnamon. While we waited for the results, Habib took us on a whirlwind tour of the nearby vegetable market where the riad sources its produce, then led us to a Berber pharmacy where we saw some of the very spices we’d been dabbling with for sale. “Spices have a soul,” the shopkeeper told us. Soon it was time to head back and taste just how soulful our kitchen experiment was. The chicken was soft, tart, and dripping with its own juices; the meat in the tagine was creamy as promised, a spirit-warming stew layered with flavor. Hassan set up a table in the main courtyard and artfully presented our dishes, and we tucked into the results of our epicurean efforts. OK, fine, Hassan is the one who does most of the work — but the experience gave us a newfound appreciation for dishes we’d been consuming almost daily, without much regard to the complexity and effort they require. A more hands-on class might be preferred by more avid or seasoned chefs, but for amateurs seeking a leisurely, informative, and delicious afternoon, Riyad El Cadi’s culinary experience is perfection. Sarah Khan was an editor at Travel + Leisure magazine in New York when she visited Cape Town on a whim and fell in love with the city... and with a Capetonian. She now freelances from the Mother City, though her travels have her spending more time away from it than she'd like. She blogs about her adventures as The South AfriKhan (www.southafrikhan.com), and you can follow her on Twitter and Instagram: @BySarahKhan.